The Angriest: Star Trek: The Next Generation: "Descent, Part II"
Star Trek: The Next Generation: "Descent, Part II"
It is 20 September 1993, and time for the Season 7 premiere of Star Trek: The Next Generation. Data (Brent Spiner) has turned against his crewmates to ally with his twin brother Lore. While Data begins to conduct a potentially lethal experiment on La Forge (LeVar Burton), Riker (Jonathan Frakes) and Worf (Michael Dorn) make contact with a Borg resistance group. "Descent" simply fails to work as a story. There is something crudely superficial about it, as if the writers involved simply felt that 'Lore and the Borg team up' was a sufficient draw to make an entertaining pair of episodes. It simply fails to make any sort of impact, or indeed pick up where the Season 6 cliffhanger left off. Rather than destroy the Federation as claimed, Lore and Data simply continue some experiments into creating artificial life - including possibly killing La Forge in the attempt to give him brain implants. 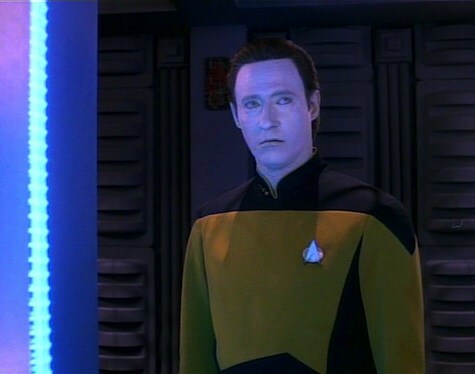 Data's personality change is hugely problematic. As far as the episode clarifies things, Data has his emotions activated by remote and his ethical programming shut off, and that is enough to transform him from the Data viewers have known for six years into a sort of amoral, mean-spirited and murderous mad scientist. It questions why, even after regaining control of his own programming by the end of the episode, the Enterprise crew or Starfleet generally would ever trust him to be an officer again. Riker and Worf meet a small resistance group of Borg, led by Hugh (Jonathan Del Arco) from "I, Borg". They seem a weird choice of characters for Hugh to meet, since neither played a significant role in that earlier episode. The entire Borg element of this episode feels deeply underwhelming; rather than the terrifying threat they were in the past, they now come across as generic enemies to be shot and killed. Up in orbit, Dr Crusher (Gates McFadden) does a fine job of commanding the Enterprise. Quite why the ship's doctor has been deemed the most appropriate person to command the ship into a combat situation is never made clear, and does not make sense. It is a shame that the one time Crusher gets some decent dramatic material it is in a situation that is somewhat ridiculous at the premise level. Despite that it is probably the most enjoyable thread of the episode and makes nice use of some series continuity with the use of the metaphasic shield technology from last season's "Suspicions". The episode ends with Lore's defeat and permanent deactivation, which Spiner plays incredibly well. It is a shame that Lore does not feature so prominently in his final episode; there was always a huge potential for the character that never quite got realised despite his appearance three times over the course of the series. This episode is an underwhelming mess that fails to properly develop any of its ideas. The final season of The Next Generation is not off to the best of starts.